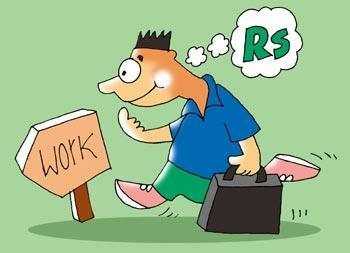 Rediff.com » Getahead » Does your bank balance define your success? In the pursuit of money, a lot of people take up careers that they are not made for. If you love what you do, wealth, power and fame will automatically follow. We have been made to believe that a successful career is the perfect combination of the highest designations, fattest pay checks, and the best perks. If we have enough mansions, sports cars, and paparazzi following us, it means we've made it. Newspapers and magazines have distorted the meaning of success to such an extent that the common man now believes that he needs to own the wealth of the world or die trying to become 'successful'. Let's try to debunk a few myths about what it means to have a successful career. While it is true that you can make your career a success by following a proven path, you can also achieve prosperity by doing things in ways that have not been tried and tested before. With globalisation changing the face of our marketplace every day, new ideas and lesser taken roads can also lead to success. Don't be afraid to break the rules as the route to prosperity is as unique as you. In the pursuit of money, a lot of people take up careers that they are not made for or careers they have no interest in. Instead, one should focus on pursuing their passion. If you love what you do, wealth, power and fame will automatically follow. Those who keep score in life based on their bank balance often find themselves bankrupted in the big things that actually mater. This may be true for when you were a child and your parents were responsible for your well-being. However, as an adult you need to have a proper understanding of what you want from life and which career move will work for you and which won't. Having mentors is a good thing but trusting your intuition will work better for you in the long run. Your values and morals will lead you to victory and nobody knows that better than successful people. Whatever the circumstances, you need to be in touch with your inner self at all times. Stay rooted to the people who were with you from the very beginning and you won't find yourself in the middle of a moral dilemma when you're finally at the top of the ladder. Every task you do right and every promotion you get defines your success. If you feel you'll be prosperous only after you have lots of money, you are looking at your life and career in the wrong way. Take every day as it comes and try to make it a stepping stone that will help you realise your dream. Don't be afraid to face your fears and maximise your potential in your quest for success. Set your own rules and follow a unique strategy that will allow you to be your true self. This way, you'll be victorious on your own terms. Dear students, do you have these life skills? Married? Why should you let it affect your career?